8 pgs. Appeared first time in Eerie #57 (1974). 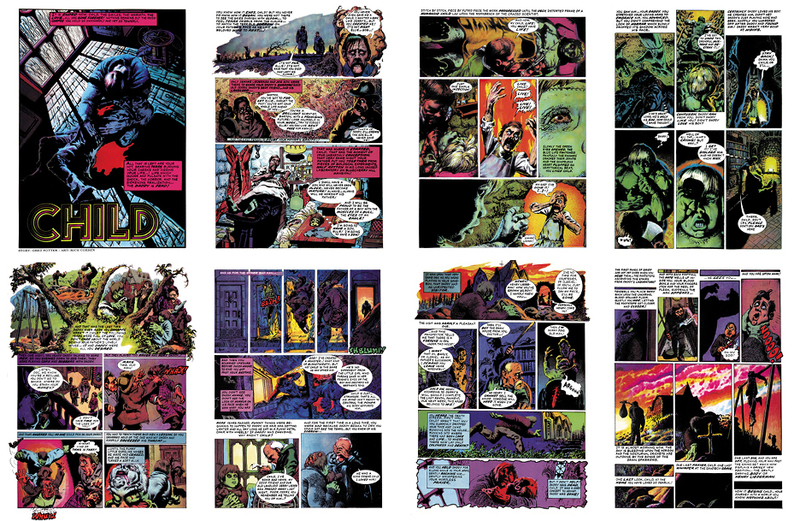 Reprinted in Comix International #1 (1975), in Comix International #4 (1976), in Heavy Metal Special: Richard Corben Special (1998) , in Heavy Metal Special: The Best of Richard Corben from Creepy & Eerie (1998) , in Creepy Presents Richard Corben (2012) , and in Eerie Archives Volume #12 (2013) . Story: Greg Potter. Color(colored by overlays)/Art: Richard Corben (no signature, © around 1974). Lettered by hand (Warren). BR: as Child [BRA], Part 1(2! ): "Child [BRA]" in Almanaqua de Kripta [#1] (1977). FIN: as Lapsi, Osa 1(3): "Lapsi" in Shokki tekijänä Richard Corben #1 (2013). FRA: as "Gamin [#1]" in Creepy [FRA] "nouvelle serie" #1 (1978) and Profondeurs (1978). GER: as "Frankie" in Vampir-Comic #8 (1975), and as "Kind" in Die Aussergewöhnliche Welt des Richard Corben, Vol. 2 (1980). ITA: as "Bimbo [#1]" in Collana Umanoidi #6 (1982). NL: as Kleine Jongen, Hoofdstuk 1(3): "Kleine Jongen" in Richard Corben #2 [NL]: Diepten (1981). SER: as Dete, Part 1(3): "Dete" in Jeznovik #2: Ričard Korben (2013). SPA: as "Niño", in Rufus #19 (1974), El extraordinario mundo de Richard Corben #2 (1981), and Rich Corben #2 (1993). Original Art Plate: Pen and ink, markers. brush, and gray pencils on paper, 11" x 17". Synopsis: A wife of a man is dead. Man wanted a kid with her, but now the urge to get kid pushes him to build one. He creates a frankensteinish creature with a mind of a child. Unhappy event in a family forces the child creature to leave home. Comment: Corben's color artwork and Greg Potter's first story of a series of the child creature are much better than following sequels. Comic is full of innovative and beautiful frames; colors, though, in whole series are a bit too murky. Alternatives, : Restored with piety by José Villarrubia. 2nd: Scanned from the original artplates by Richard Corben. Created: August 24, 1997. Modified: March 26, 2017.